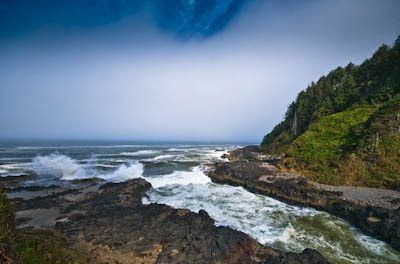 Cape Perpetua, on the central Oregon coast just south of Yachats, is a dramatic mix of ocean, black lava and grand old growth forests. Seemingly small waves crash and spray, long channels are foaming and turbulent. Close offshore, gray whales are diving for small shrimp in the kelp beds. 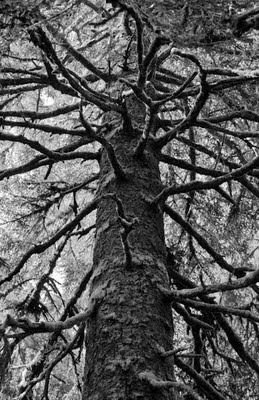 With some protection from the high winds, the Sitka Spruce can grow to very impressive sizes. The National Forest campsite here is close along a creek bed surrounded by a diverse forest and these wonderful, old trees. Black and white draws out the beautiful structure and interplay of texture of bark and moss. 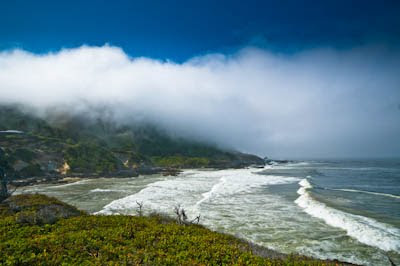 Devil's Churn is near the campground, and a very worthwhile stop for a variety of photography. The ocean color seems unusually yellow-green in many areas this year.